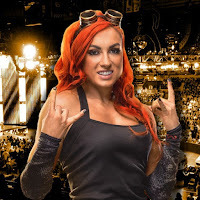 Becky Lynch spoke with Sports Illustrated this week and said she is resolute in the belief that she was built for this business, unlike Ronda Rousey. "Only four months after having a part-time schedule, after making her debut at WrestleMania—having been on the cover of everything, just handed everything, she was crying in her kitchen about how she couldn't make her husband breakfast," Lynch said. "She couldn't hack our schedule. Yet we do this every single night, 52 weeks a year, yet she couldn't handle it for four months." Regarding her recent rise to being one of WWE's most popular Superstars, Lynch said she treats her spot like a political campaign. "I approach this as a political campaign," she explained. "Any time I've the opportunity to get my voice out there, get myself heard and my message across, I use it. I want to make sure I do the people proud." It was noted that Lynch now hopes to headline the grandest stage of them all two years in a row with the WrestleMania 36 main event in Tampa on April 5, 2020. "This is when the hard work starts. I've got two championships to make," said Lynch.